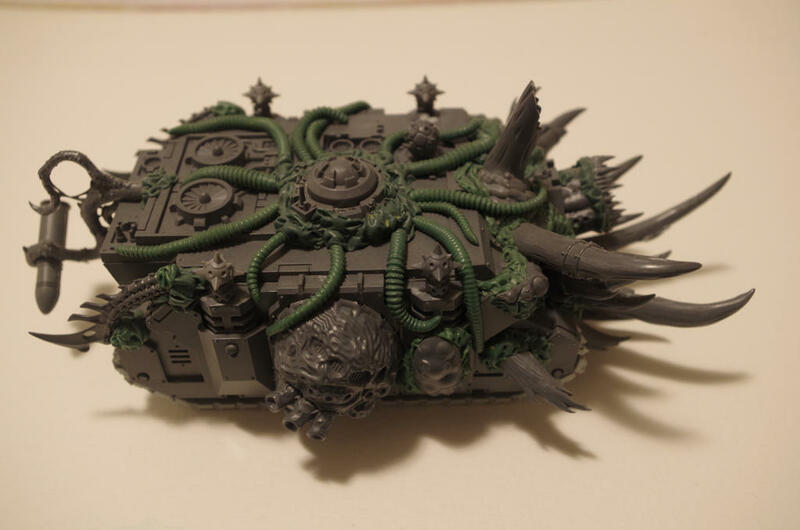 Modelling | Azazel's Bitz Box. Meet Dave (the Evil Overlord)! 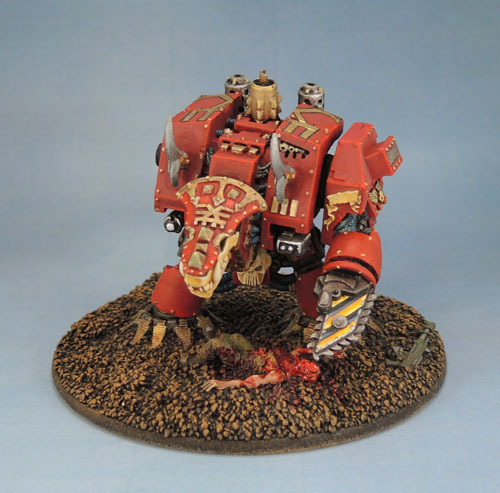 Khorne Hellbrute/Dreadnought – built by Dave, painted by Azazel. Regular readers will remember that awhile back I painted a Khornate Dreadnought (Hellbrute) for an old friend called Dave. 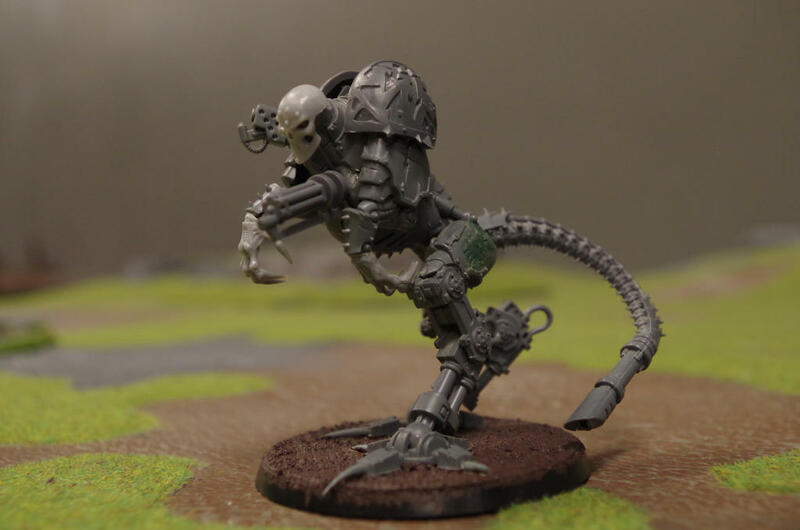 Well, I finally managed to track him down recently, and while he’s not a blogger, he is still converting, kitbashing and modelling and has a home over on Deviant Art, under the name “Davidtheeviloverlord“. I thought I’d throw Dave an internet shout-out and share some of his work here with a pointer to his pages. Here are a couple of his creations. To see a lot more of Dave’s work, head over to his DeviantArt! 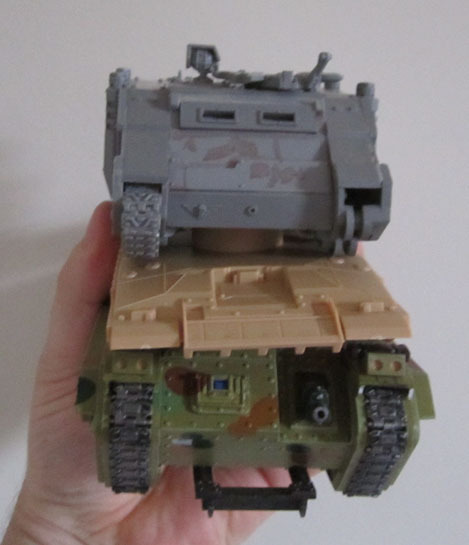 While sitting and waiting for a doctor’s appointment several months ago, I was browsing Dakka on my phone when someone posted an eBay link to some 1:48 scale tanks, by a Korean company called Adademy. 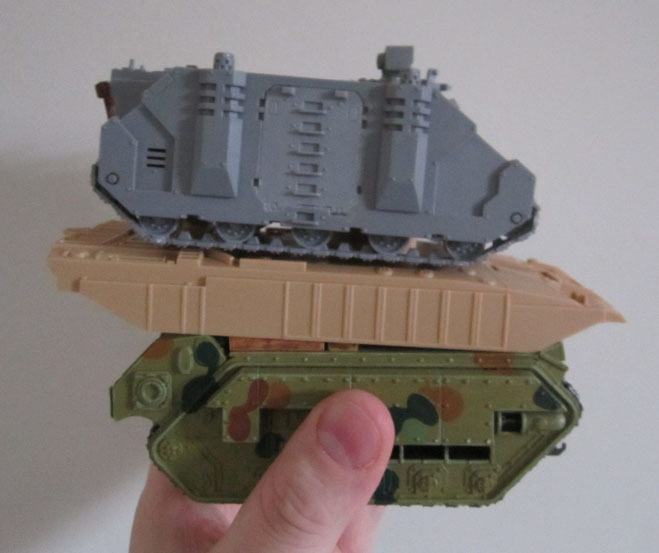 Since 1:48 is one of the appropriate scales for 28mm miniatures (some of our figures’ weird proportions are 1:35, some 1:48, some 1:56), I checked out the link, and on seeing the price of $15 a pop with free shipping, 5 minutes later, I’d ordered a platoon of three British Challengers to use in moderns or proxy into 40k, WarPath or any other games that might require tanks – particularly ones that look like they might actually work. 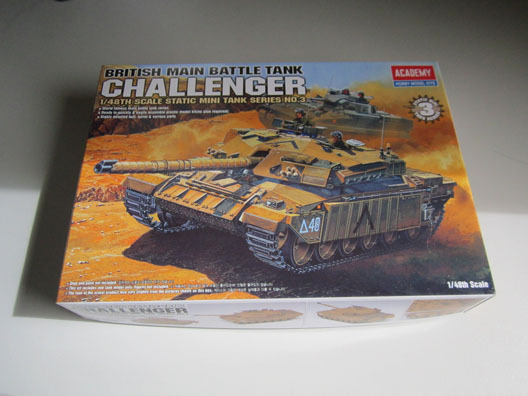 I went with the challenger since it looks modern and pretty cool but isn’t as immediately recognisable as the US Abrams series (to those of us outside the UK, at least). Turret, detail parts and road wheels. A couple of in-box and sprue-in bag shots. Nothing too exciting here. 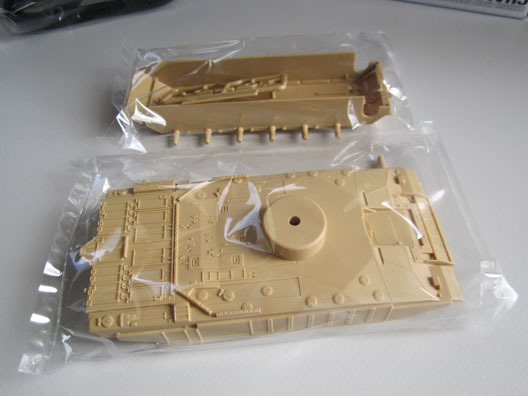 Tracks are rubbery plastic, as is not uncommon for tracked vehicle model kits. So far, so normal. 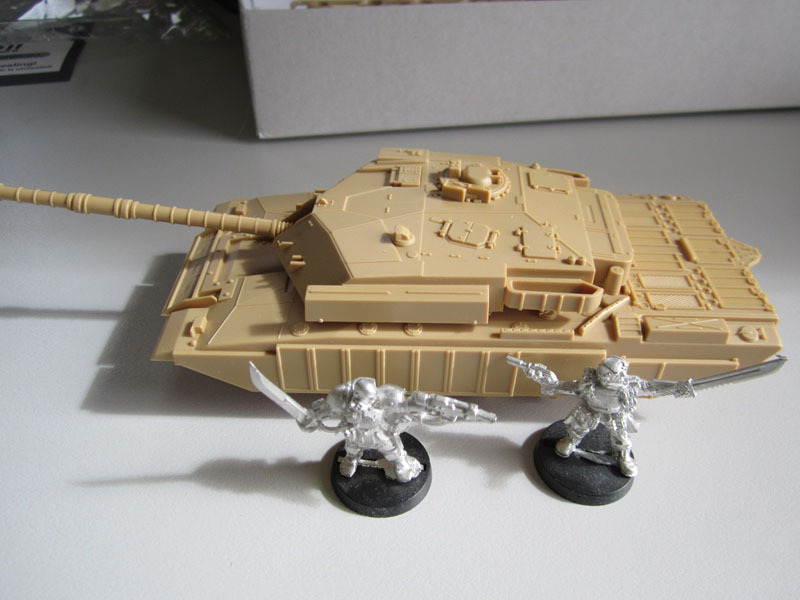 I also took a bunch of comparison photos with some 40k models, so people can get an accurate look at the size. Bear in mind in these pics the wheels and tracks aren’t assembled on the Challenger, so the actual kit would end up a bit taller. A nice amount of detail for the price. With: Techmarine, Cadian Stormtrooper, Ork Boy, Imperial Stormtrooper. Yes, I took a whole lot of photos. Mostly because I went with what I personally like to be able to see when looking at kits like this on the web, so some comparisons with other commonly-used vehicles (sorry, I couldn’t find my Russes) and some of the models most likely to be spending quality time with it (sorry, my Mantic Corporation guys aren’t built yet, and my half-painted moderns are still hiding out somewhere since I moved). As Academy is clearly a budget-ended model company, you can see how they subscribe to an “out of sight, out of mind model” with the underside of the turret and main gun. 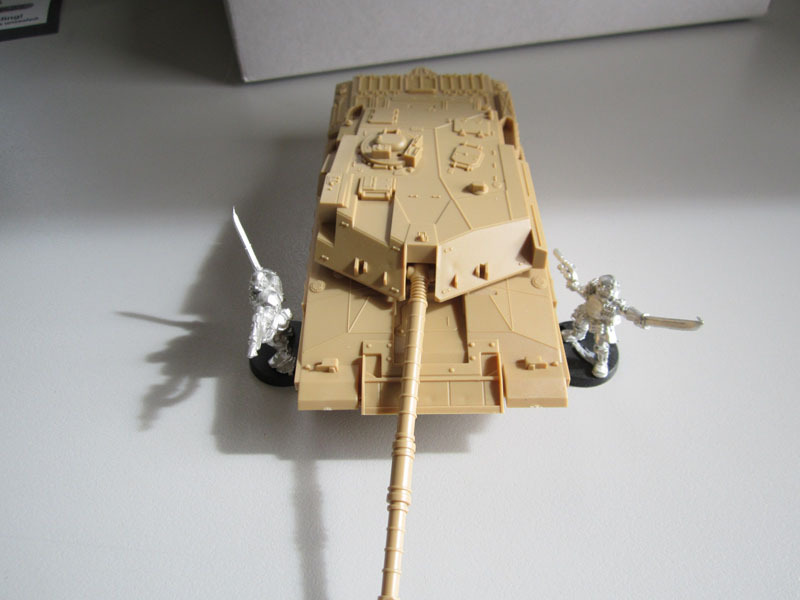 Even so this is acceptable for a model to be used in wargaming in my mind, as we tend not to remove the turret unless the model is destroyed, and the underside of the gun really can’t be seen unless you’re looking front-on at tabletop eye level with the gun elevated to maximum. 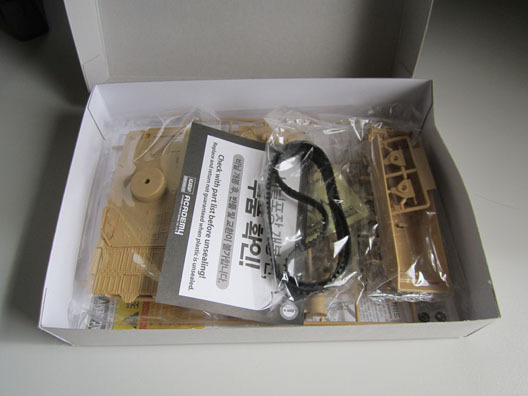 Overall, the Challenger is a nicely-detailed kit that looks like it will go together quickly and easily. 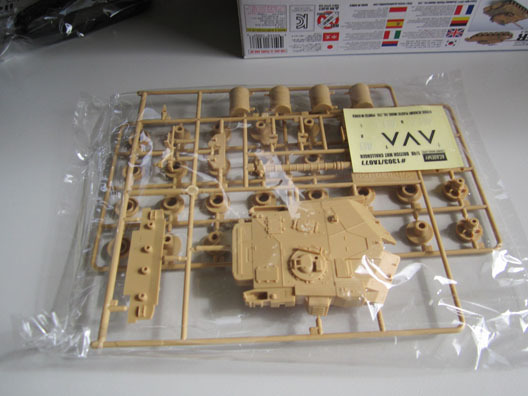 Certainly for fifteen bucks and free shipping, I found them to be a worthwhile purchase, and no doubt will find them even more worthwhile once they’re assembled, painted and used for something! 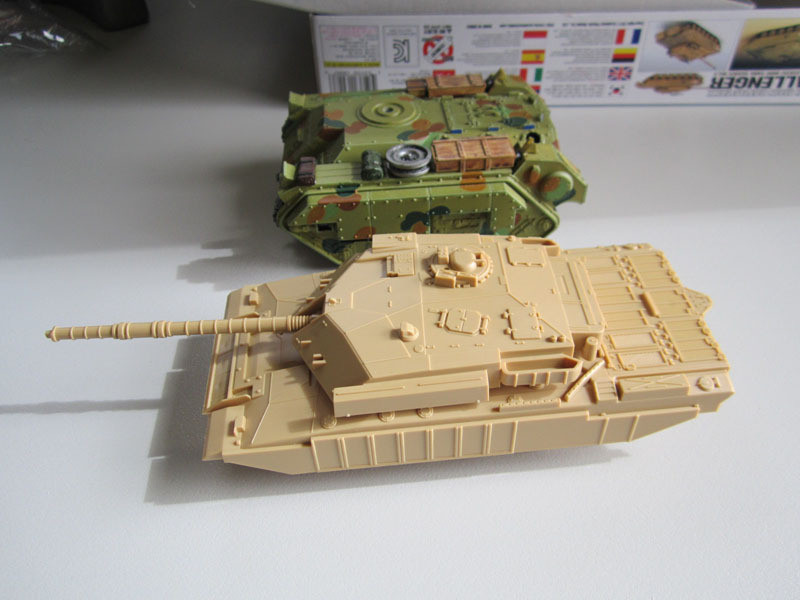 Quick edit – 23rd Oct 2015: – For the serious model makers – people from Britmodeller and Armorama, etc. I’d avoid the Academy kits. I’ve got a few others in 1:48, and they’re really not up to the standards that you’ll be looking for. 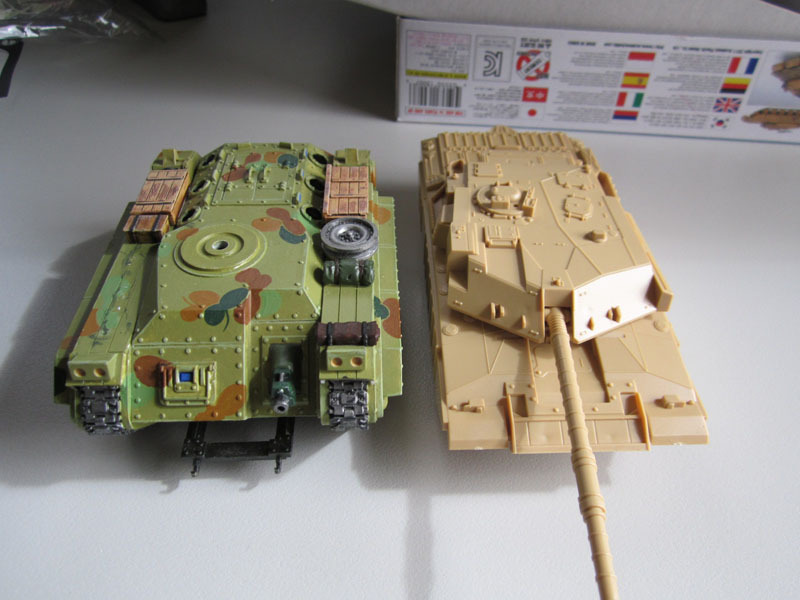 For starter modellers, your kids, and for wargamers like myself where the kits can be “good enough” in terms of accuracy and details – or used for terrain, they’re fine and in fact pretty good value. 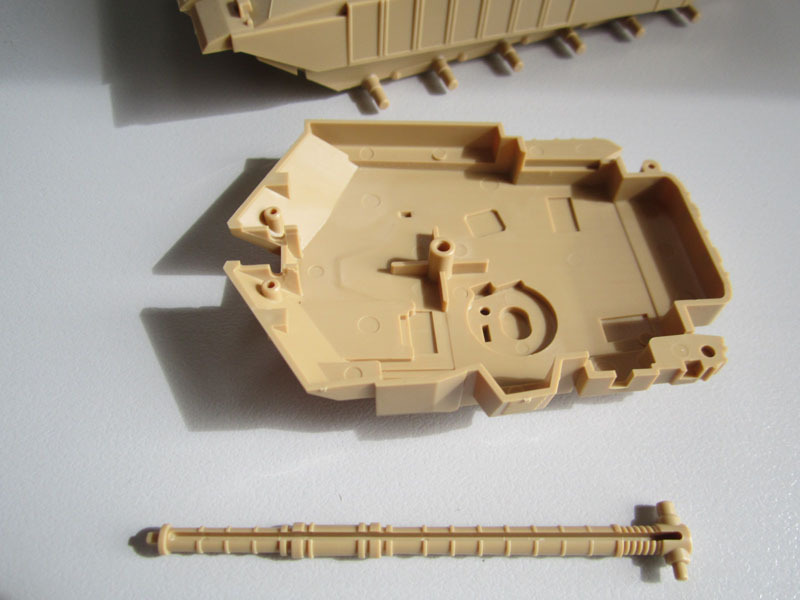 For serious armour modellers though, these aren’t the tanks you’re looking for. In what’s getting close to my final MaxMini review post for awhile, I’m sharing their various Jump Packs today. I picked up set of 5 of their Iron Pattern Jump Packs shortly after they were released, though due to the joy of moving twice in a relatively short period, they got put in a box and not used (story of my figures’ bloody life!) Recently, I decided to start to resurrect some of my armies, so I’ve been buying cool resin bits, which at the moment mostly sit around until I can work out some army lists and then motivate myself to get them started/finished. 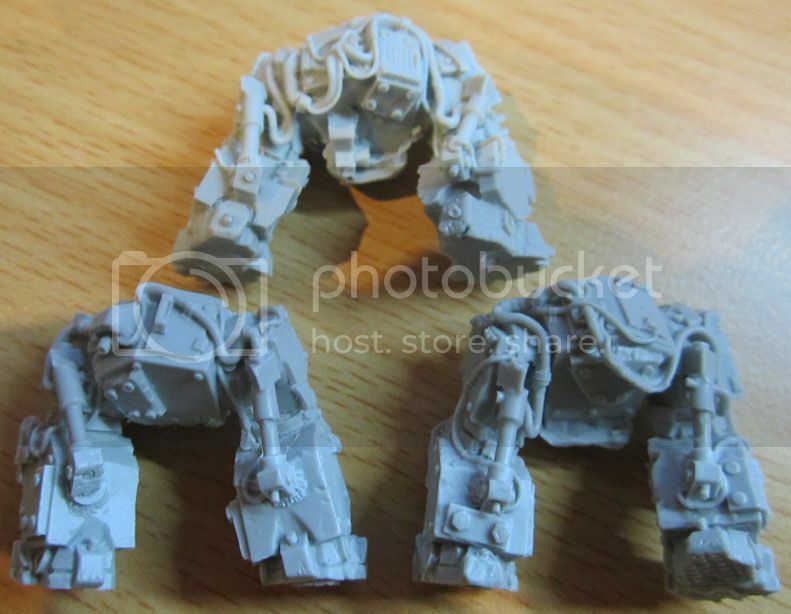 I originally got these to use either with my Iron Warriors or possibly my old-school-style Crimson Fists. So anyway, with 5 of these suckers already in hand, I needed to get another 5 to finish a squad. So I did. I may need a second 10 of them so I can kit out both armies with them. I’ve tried to give my Iron Warriors more of a Renegade Marine vibe than a gribbly chaos marine one. 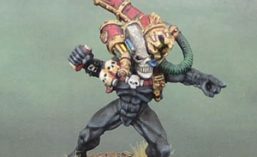 As cool as the new DV figures are, and as much as they harken back to the old Slaves to Darkness style, I actually want to go with the “loyalists with spikes” look for the dour, mechanically-oriented Iron Warriors – more likely to amputate a tentacle and replace it with a bionic arm than to accept it as a gift of chaos, so studded mechanics work from my perspective. Size Shot – Maxmini Iron Pattern Jump Pack. 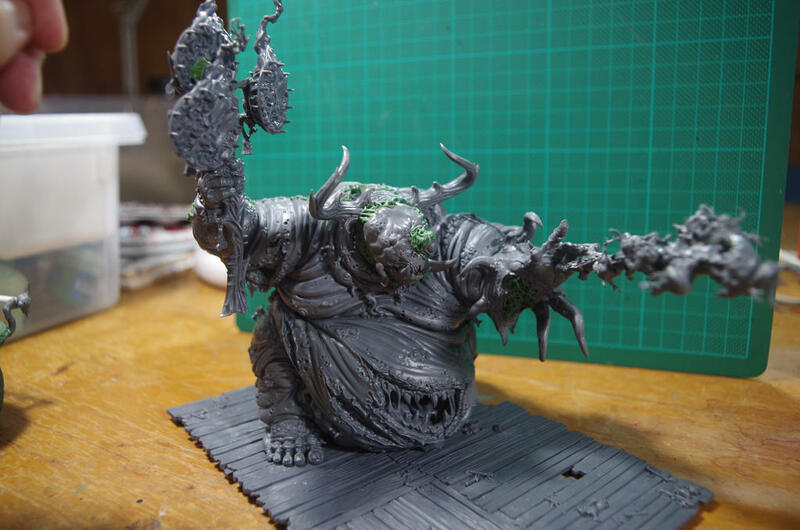 Here’s the pack being modelled by a marine I’ve been working on for a mate. He won’t have a jump pack in his final form, but since his wasn’t glued on, I thought he’d work fine as a Jump Pack model. As you can see, this Jump Pack is a pretty big piece of work. While I was at it, I decided to pick up a set of 10 of their other two new styles. The Silver Wing Pattern Jump Packs will go perfectly with either Blood or Dark Angels, and as I have a small DA force and an unbuilt BA force, there’s potential to once again buy a second set of them so both forces can use them. The DA already have a mostly-built Assault Squad though, so maybe I’ll just grab another 5 for some Character models. Size Shot – Maxmini Silver Wing Jump Pack. As you can see in the photos, the Silver Wing packs are just as big as the Iron Pattern, though I was surprised as the details are almost entirely different, aside from the turbines and the part that plugs into the back of the model they’re being mounted on. The detail is really quite nice, with lots of exposed wires, pipes and tubes again giving it an old-school look, though perhaps not all that OH&S-friendly. Finally, I grabbed a set of 10 of the Bronze Pattern Jump Packs. These don’t fit the old-school vibe in the exact same way as either of other the turbine-topped styles, but I thought the huge vented intakes looked pretty cool, so I again got a set of 10 to kit out a squad (of something TBD). Size Shot – Maxmini Bronze Pattern Jump Pack. Now if you thought the other two were big, these will really impress. These ones are edging towards being ludicrously big, but despite this, I really like them. The sculpting and design on them are really well done and a bit different. 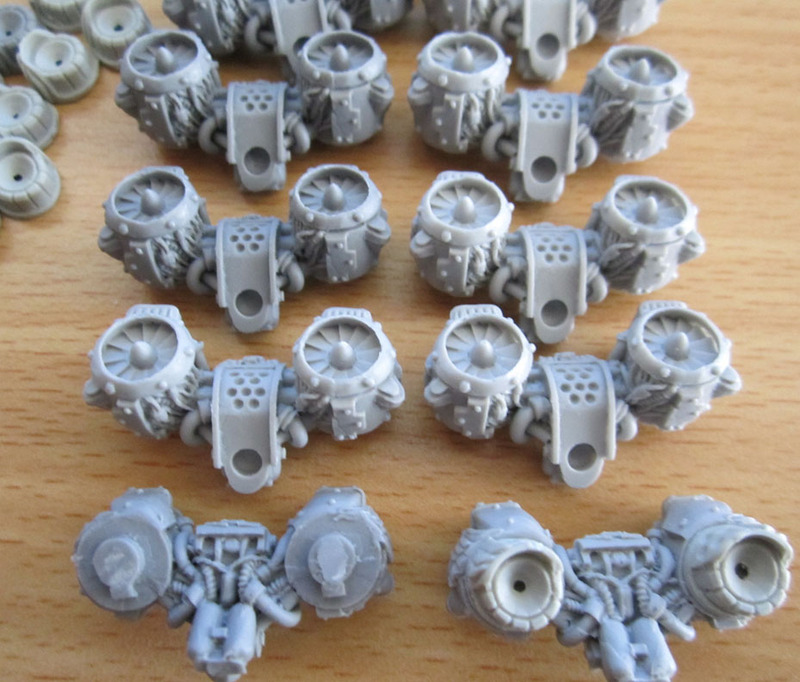 They still look a little Horus-Heresy-retro, but perhaps like something that was newer then. 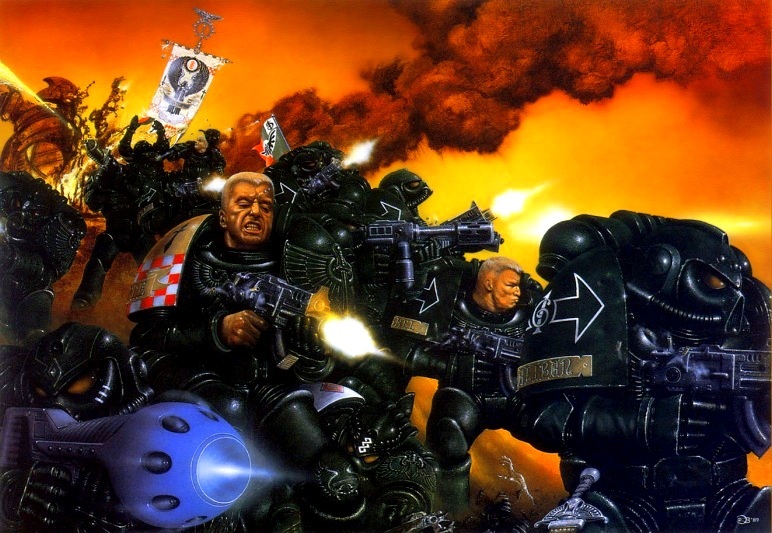 They look like something that would fit in with the era of this classic Paul Bonner Dark Angels painting (used as a WD cover back in the day). Not-quite Rogue Trader, Not quite modern era. Around the days of Adeptus Titanicus and Space Marine. Note the marine firing! If you look carefully, you can see how he’d probably like you to say hello to his little friend..
Paul Bonner’s seminal Dark Angels-Scarface artwork. 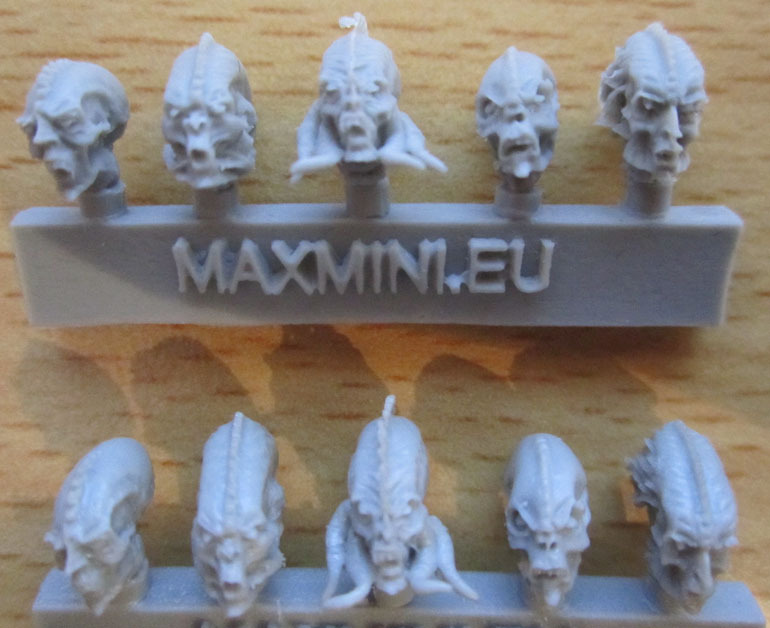 MaxMini Head sizes – Polish Resin Extra! After some requests for size comparisons on the MaxMini from Dakka and in the comments, I’ve taken some quick photos to help people judge which heads are right and wrong for their own purposes. I’ve also got an older review – of the Steam Knight helmets. 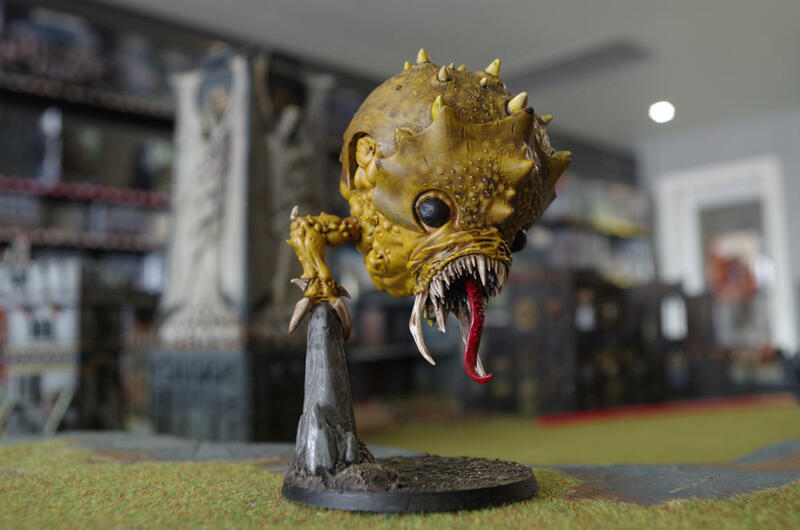 Though I only used Marine bodies on that one, as you can see in that post, they’re on the smaller side, and so I think they’d work on smaller like the below Mantic/McVey models as well. 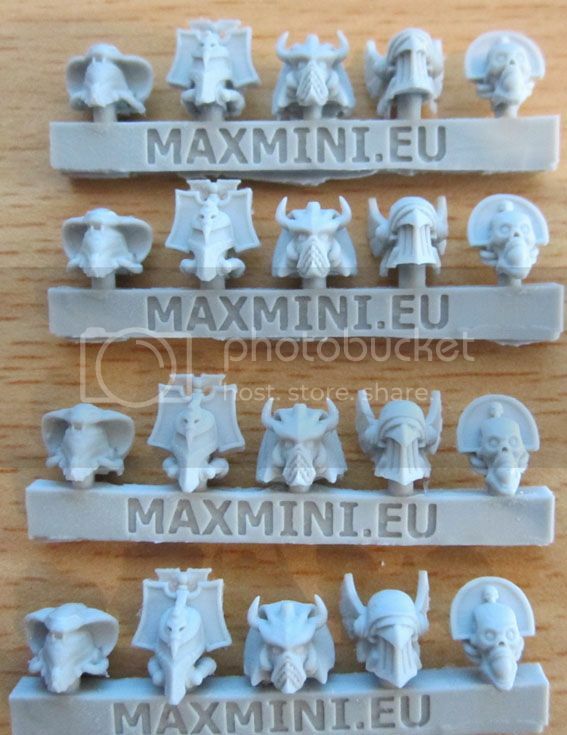 MaxMini heads and various figures. 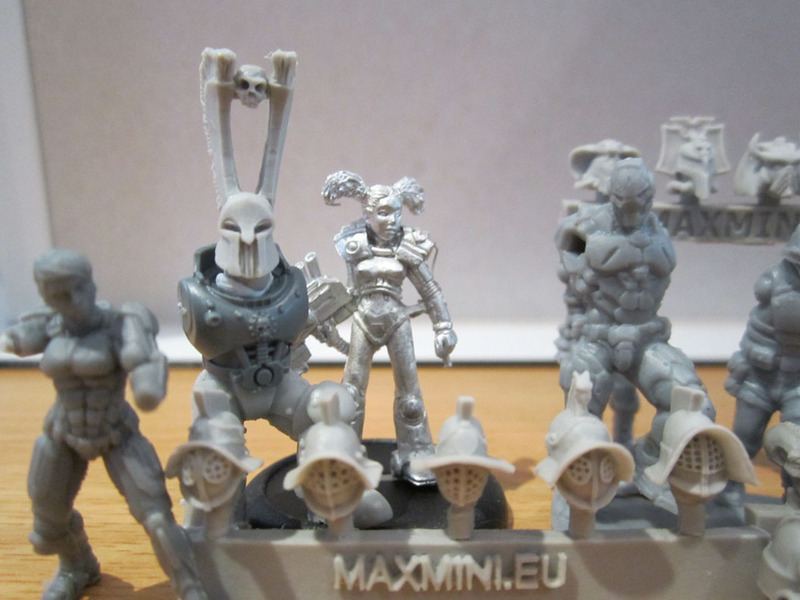 From left-right, we have a Sedition Wars female, a “marine” made of a Maxmini head, GW torso and Anvil Industries legs. A sci-fi Bombshell Babe. She’s about the height of a marine, but less bulky – A good representative for many of Reaper’s sci-fi figures. Next is A Mantic Enforcer, Mantic Corporation with actual head, Sedition Wars male, and another Mantic Corporation fig with Maxmini “Biohazard” diving bell. Last up, we have a completed GW Space Marine. So. Opinion time. The gladiator helmets are a little small for marines, but workable. They’re also suitable for the McVay and Mantic figures, as actual gladiator helmets are pretty damned big. The Black Lotus helmets are perfect for marines, but a bit big for the truescale figures – unless you want big ancients helmets for them. The “Immortals” Egyptian helmets would work on the McVey/Mantic bodies. They might seem a touch big, but then there’s a lot of bling on them, so if you disregard all of the spikes and so forth which make them look bigger, they work. Similarly, they work on marines, but may look a touch smallish. The Mecha-Egyptian helmets (V.1) look perfect for marines, but a bit big to go with the truescale figures. Similarly, the Biohazard heads are perfect for marines but too big for the truescales. A possible exception for the “diving bell” helmet, since diving bells IRL are huge, so with a trim to the neck they could work with truescale figure – depending on what you’re trying to do. The Hybrid heads are a good fit for truescale figures – bear in mind that they are deliberately bulbous, though. They seem a little small for marines. So it’s the next set of pictures and commentary of the recent order I received from Maxmini. 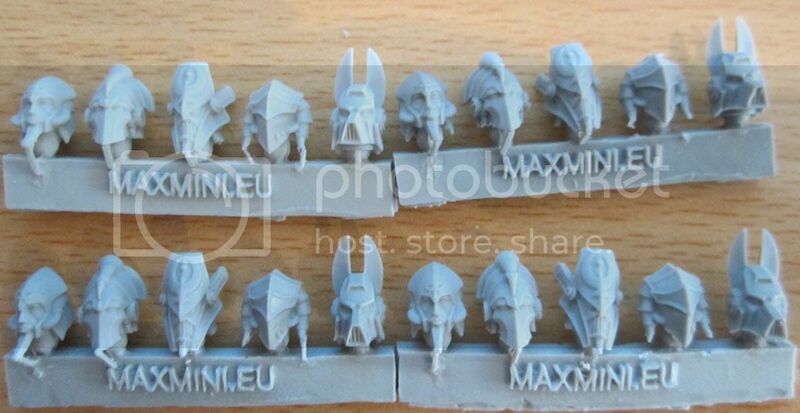 In my last post I looked at the two types of Mecha Egyptian heads that they offer. This time it’s a bit more varied. Once again, all images are clickable for bigger versions. Next up are the Alien Hybrid heads. Again, I bought these without any immediate purpose. I’ve got a bunch of old-school Genestealers and Hybrids that I need to get around to sometime, but they’re not a priority in my paint queue for the time being. As you can see, they’re finely detailed, though they’re quite small – more truescale than heroic. Having said that, I’m sure they’d work well on top of a guardsman’s body. Something I’m happy to have in my bits box for the moment when I’m building something and decide I’ll need them. MaxMini Biohazard helmets. Unlike the others, I knew exactly what I wanted to do with these from the moment I saw them. These will be going onto the heads of Plague Marines and Death Guard. When I got these, I opted out of the one sculpt that didn’t appeal to me (in execution, not concept) by asking the MaxMini guys for a custom mix. Since they’re able to do that without a hassle from a lot of the items in their range, it was no problem, and I picked up an extra pair of the “diving bell” sculpt, which I really like. I’ll probably pick up some more of these down the line as well, as the Diving Bell also has a lot of potential outside of the specific CSM use I plan for most of them. As you can see, these parts are pretty much flash-free, with just a small bit of cleanup required on an occasional piece. Clean bubble-free casts, and quality (non-itchy!) resin. 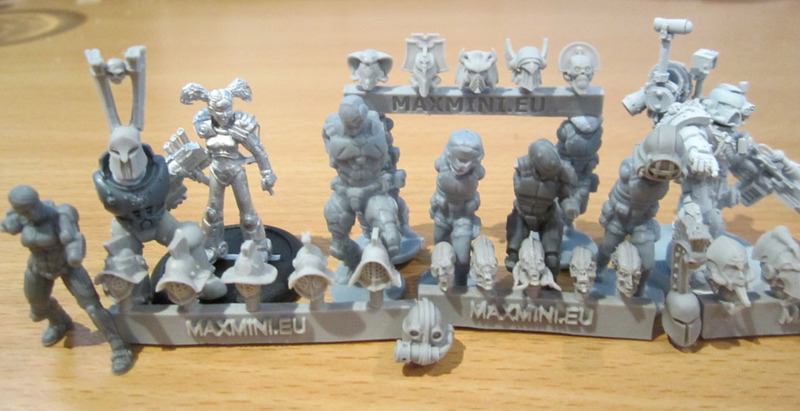 The next post will be MaxMini stuff, as I’ve got some jump packs and other odds and ends to review. After that, I’ve got a bunch of stuff I’ve bought from Kromlech, Scibor and Puppetswar to photograph and review, so the Polish Resin series will have a fair few more installments to come! As always, I hope people find these shots useful! I’ve picked up some more new stuff from the talented artisans in Poland. 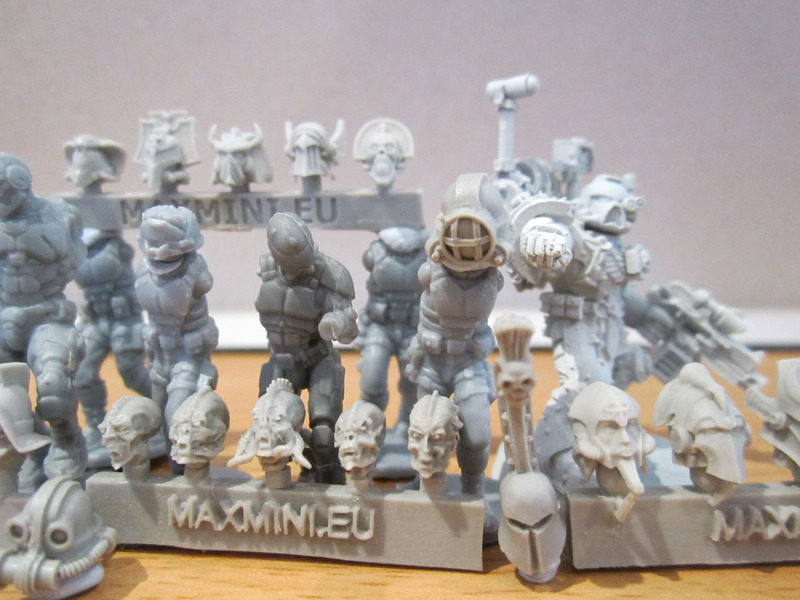 This time, a selection of items from Maxmini. I have bought stuff from them a few times before, and never had a problem with their service or quality – this order once again lived up to my previous experiences. Three week turnaround from ordering to arriving in my happy paws in Australia, which is a little longer than most orders from the UK or US, but 3 weeks from Poland including processing time seems pretty fair. It certainly doesn’t take months for stuff to come from Poland, as others have suggested. I should point out that I’m not affiliated with Maxmini in any way and paid full normal retail for this order (and the previous ones) – I simply like to support businesses that offer quality product, are friendly, efficient and don’t screw me around. So anyway, I placed a decent-sized order with them, now I’m sharing them with the world. Next up I need to actually do something with them. (hopefully!) Too much stuff to paint, and too many distractions. When I saw these two types of heads, I knew they would work really well with a Thousand Sons force. 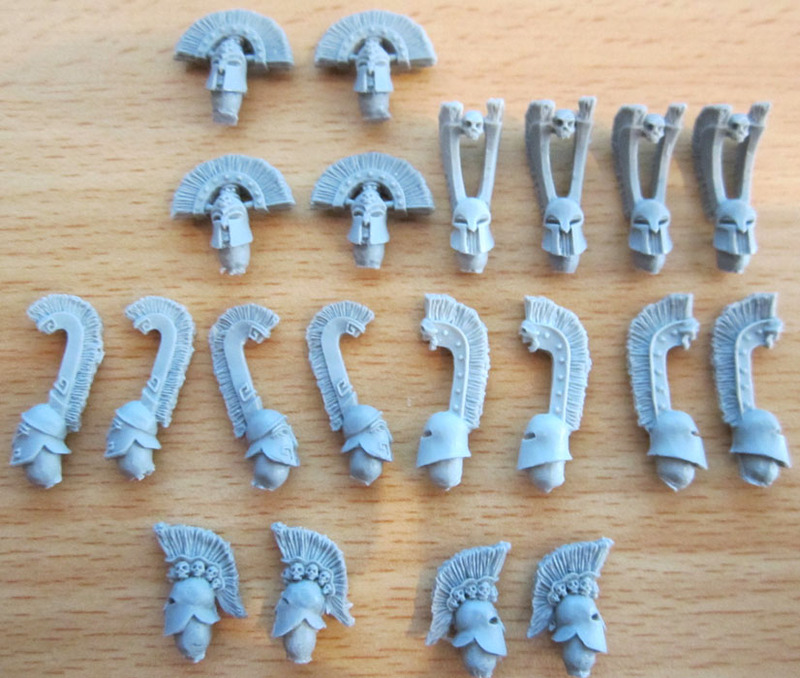 I’ve got quite a few of the GW TS heads, but I think these will mix in really nicely to reinforce the Pseudo-Egyptian theme. Yeah, I should have photographed the Mecha Egyptian helmets in descending rows like I did the Immortals. Now for the Close-up shots! (all images clickable) You can see both the detail and how clean the casts are. 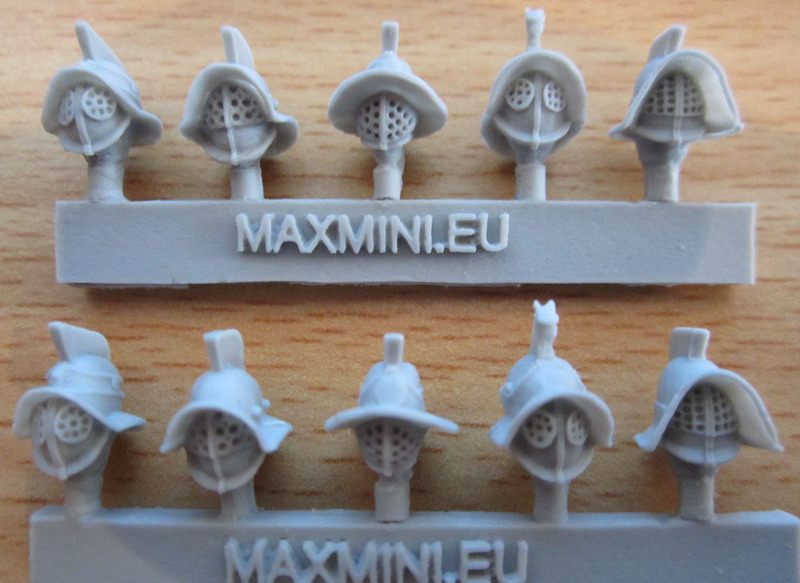 Maxmini Mecha Egyptian Helmets – Close Up. I also bought a bunch of other heads and Jump Packs in the same order, but I’ll put those up in the next updates over the next few days. They’re just as good as I’ve come to expect from Maxmini, though. 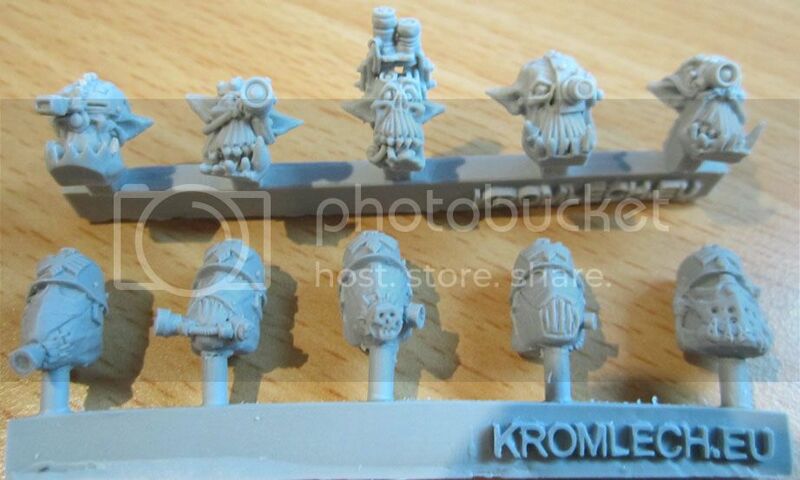 A few weeks ago I saw some previews of some new items from Kromlech, a polish outfit who do resin conversion parts that happen to fit popular heroic 32mm Orcs and Armoured Space Warriors. 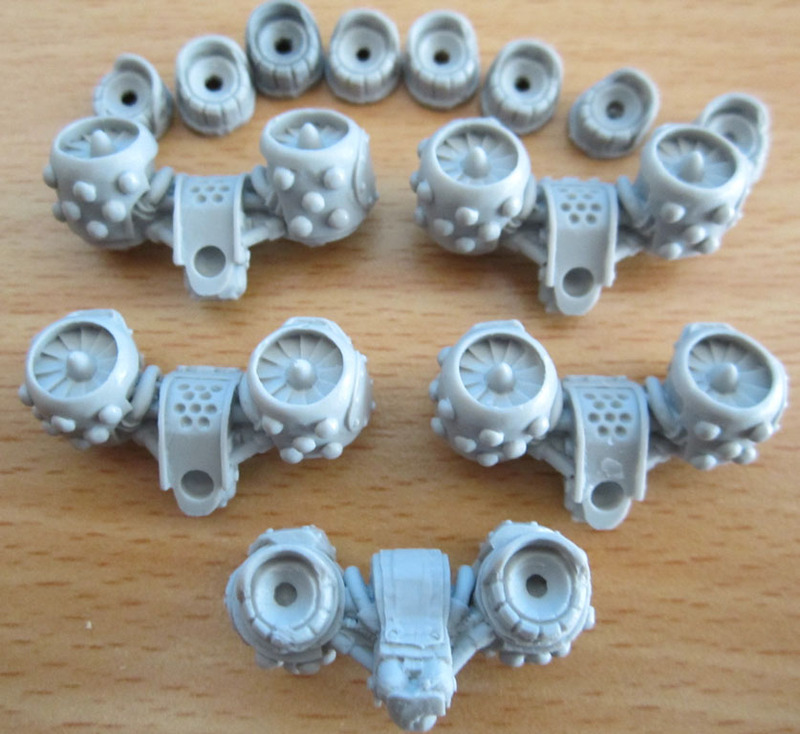 I’ve gotten stuff from them on occaision, but when I saw these, I knew I had to order them right away, as I knew they would fit outstandingly into my Ork army. No pics of the painted elements of that army unfortunately, as they got attacked by a dragon from the warp a couple of years ago (or possibly a cat) and there was critical falling damage and then some foot-crushing damage when I next entered that particular room. Then I had to move. Twice. So they’re still “in the shop” until I get properly set up here. Anyway, when I saw these, I had to own them. So I made that happen. By sending them money. The casts, as you can see are absolutely brilliant. No flash. No bubbles. Every bit of detail is crisp and visible. The resin is not the type that makes you itchy. They’re literally a pleasure to look at and handle. I haven’t been this impressed by a new figure in quite some time. Why? The details and the casting. You can really tell the thought and care that went into these models by looking at all of the little things. The scavenged weapons bolted onto the arms are filled with detail, right down to the wires and tiny hydraulics that are jury-rigged up to pull their triggers. The set also comes with 5 heads so you’ve got a fair bit of choice for the three, or if you purchase more for a bigger unit, it’s that much easier to individualise them. 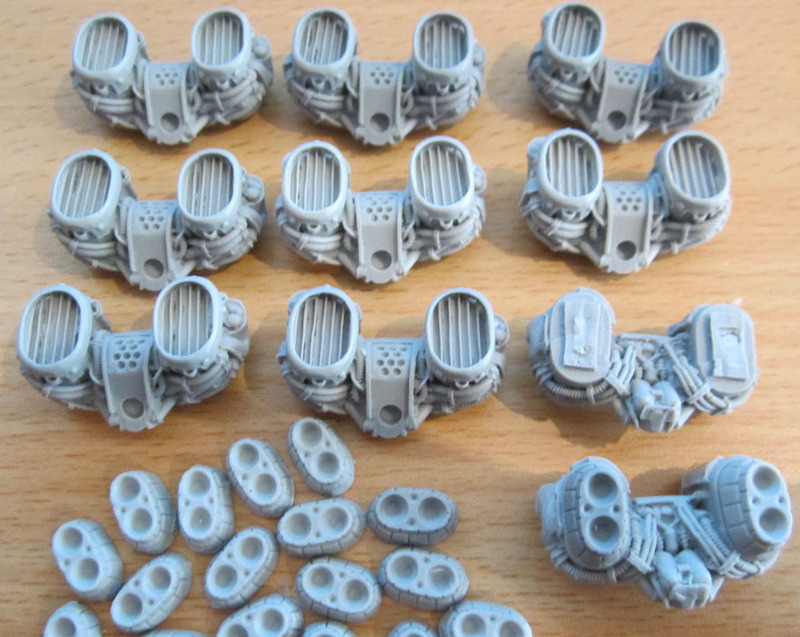 I also got a set of their Orc Gas Mask heads that I may or may not use on these – or perhaps on some infantry. They’re also huge. Stacking up as bigger than Ghazkull in mega-armour and pretty solidly to Killer Kans. Regular Mega-Armoured Nobs won’t stand a chance. 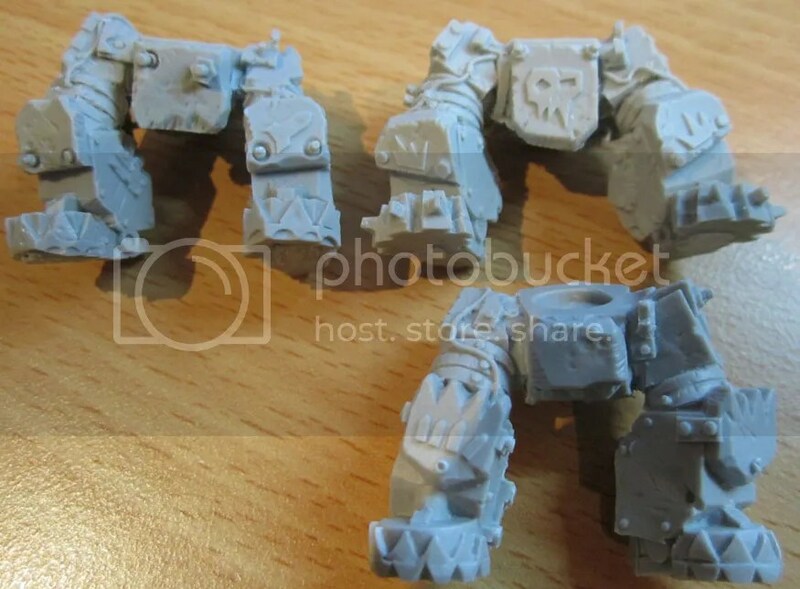 So they’re also completely suitable for use as a Warboss. 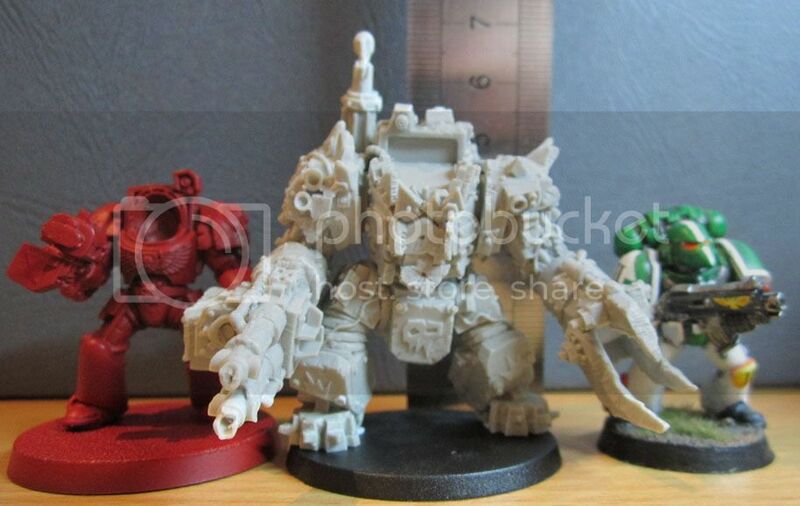 I also included a Terminator and a power-armoured marine, who both just look weedy in comparison. Orky Size Comparison. Note the Kromlech Base is slightly shorter than the GW ones. Size – Compared to Marines. Armoured heads on top. Gas Mask heads below (purchased seperately). So basically, I was impressed by how they looked online, and having them in hand, I’m even more impressed, and a little surprised at how good they are (a lot of the little details just aren’t visible in the preview photos I saw) and how well they’re cast. I should point out that I’ve got no affiliation with Kromlech and I bought these for full price from their eBay store. If you’re interested in checking out more by Kromlech, look up the Kromlech.EU Facebook Page or these figures can be bought directly from the Kromlech eBay Store. 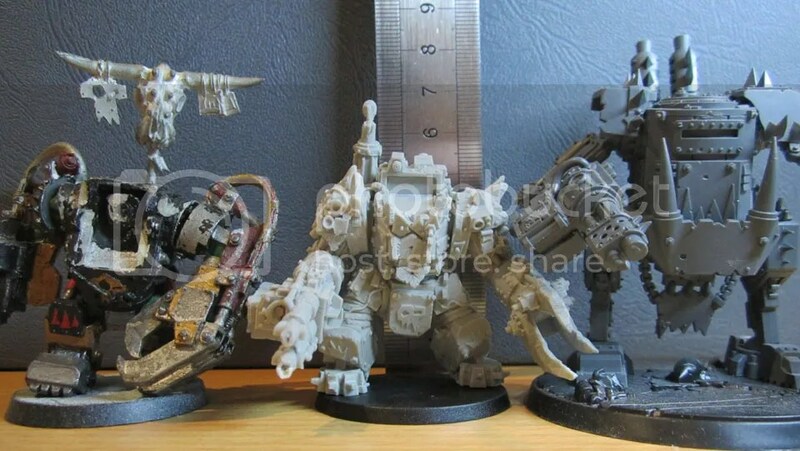 Basically, if you play Orks in Warhammer 40k, are looking for an impressive and imposing model for your games of Deathwatch or Rogue Trader RPG, or just want a big cool model to paint up, I can easily give these my highest recommendation.